We should have known it was going to be a disaster from the moment we encountered a hoard of teenage girls in the doorway of By Chloe, taking selfies and screaming with excitement. We should have just turned around and walked out again, right then and there. We should have gone down the road and into any other - yes, any other - eatery in the vicinity. But we didn't, and so fast forward a few seconds and we've managed to get past the doorway and find ourselves facing the counter of Covent Garden's new vegan restaurant, along with, it seems, half of East London. We stand for a bit: unsure, dazed, and a little overwhelmed. How does this place work? All around, people are standing with grey trays, looking a little despondent. What's going on? A member of waiting staff walks past, head down, like she's trying not to be noticed. No such luck, my friend. We raise our voices above the thumping music to ask politely if we might get a table for two. She grimaces, and shrugs. Her eyes are wide and a little wild: there's a state of anxious desperation. That's not how it works here, she says. Just find a seat when you can. We look back to the droves of tray-holding punters and realise that it's probably the hundredth time she's been asked that question today. We mutter thanks, and she shoves a menu into our hands before going back to head bowing, likely ruing the day she took this gig. Order first, or table first? With one last glance at the grey tray brigade, we decide on the latter. The place is split into two seating sections, so we apologetically edge over to one and linger. Vegan friend C astutely observes that they'd make a much better use of the space if they didn't have eight gigantic wicker swinging chairs instead of tables along the longest wall. But swinging chairs are so trendy, and lest we forget that the real purpose of the restaurant is to help girls in dungarees snap that perfect Instaselfie eating their vegan burgers in a cool chair. All together now: yaaaas. Turns out debating how many tables could fit in the space of eight swing chairs (I settled on fourteen) is quite time-consuming, but not time-consuming enough to get an actual seat. By now, we're one of twelve couples hovering, hawk-like, over those eating on the few tables around us. It's uncomfortable: for us, and for them. We've suddenly never been more glad to have inherited that classic London ability to completely ignore strangers. Guac save the queen, says the giant purple neon sign above our head. Twenty minutes in, we're thinking it's us who might need to be saved. "At least at Dishoom they give you chai while you wait", says vegan friend C, full of good observations tonight. We agree to split into different seating areas to try to get a table. Some minutes later I get a call. "I've got a table! I've got one!" she exclaims. Hallelujah. 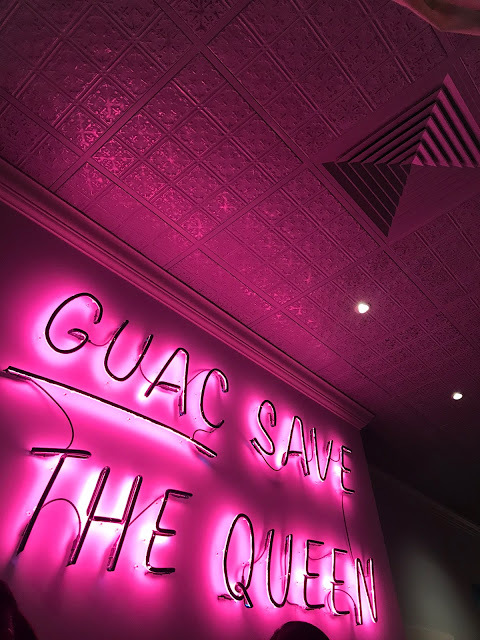 As you may imagine, by now we've had some time to look at the menu, and have both decided on the Guac burger: a black bean, quinoa and sweet potato patty with corn salsa, tortilla, guacamole, onion and chipotle alioli served in a whole grain bun (gluten-free option also available). It was only when vegan friend C actually ordered did she realise that the £9 burger (that's £2.55 or 40% more than a Nando's equivalent) didn't come with sides. Sweet potato fries ordered to the tune of £4 each (again, in Nando's comparison terms, that's £1.50 or 60% more). Admittedly this has been horribly negative so far. I'm aware of that. 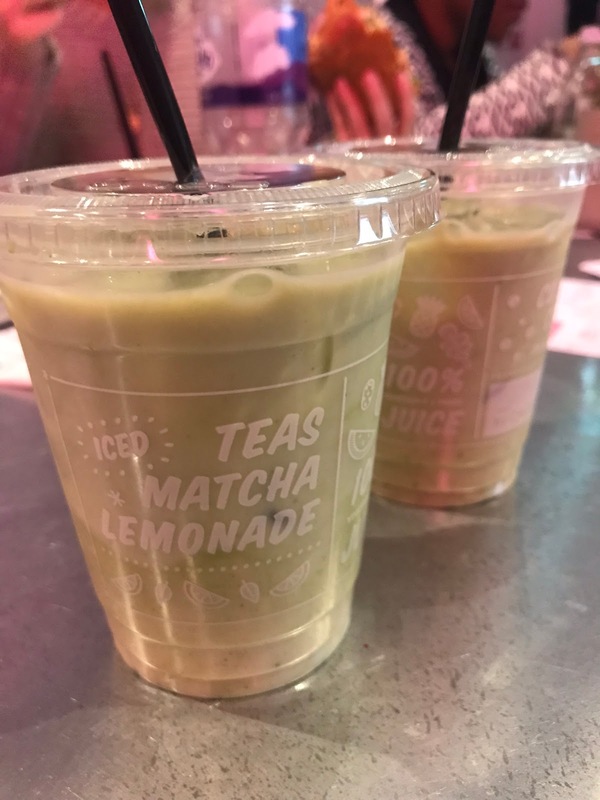 So let's take a briefly uplifting interlude to focus on the one redeeming feature of the meal: By Chloe's iced matcha lattes. They're pricey, yes, but delicious, and so hard to get in the UK normally: for any matcha fans, they come highly recommended as a treat. But grab them and go. Don't be tempted to try the food. Don't believe the hype. 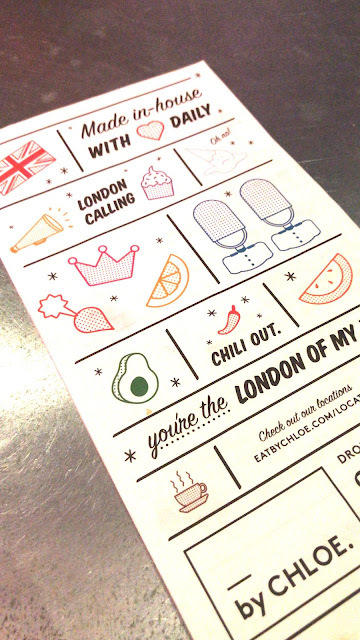 Our burgers and fries took a good twenty minutes to arrive, and when they did, the fries were distinctly average, the burger was cold and tasteless, the guac overly bland and the bun fell apart in our hands. There was no sign of the corn salsa, tortilla, onion or chipotle alioli we were promised, either. Disappointing was an understatement. "Oh my gahhd," slurred a young lady packed in tightly next to us (we were sharing a small table with many others, but table beggars can't be table choosers). "This burger is like, it's just so incredible I honestly can't believe I'm not eating meat. Like, wow, seriously." We pondered for a while on just what kind of meat she'd been used to eating. By this point, vegan friend C and I had resorted to hysterics. "It'll make a great story," I said. "The worst restaurant we've ever been to," she agreed. We decided to leave. As we were arranging ourselves to do so, a waiter dashed over to clean the table before the next bunch of hapless punters took their seats. As he did so, he generously sprayed not only the table, but also us - quite unapologetically, and quite thoroughly. A nice thorough disinfecting experience, to end our time at By Chloe. So here we were, friends: covered in disinfectant, still hungry, and now hysterically laughing. It was quite something, that's for sure. And so out we went, past the "grab & go" cabinet and the £8.60 bowl of salad leaves and the £4.75 coconuts, and past the next hoard of teenage girls squealing with delight as they layered heart filters onto selfies with the By Chloe sign. Out we went, onto the street. Freedom, at last. London's polluted air never smelled so good. Don't believe the hype of By Chloe.